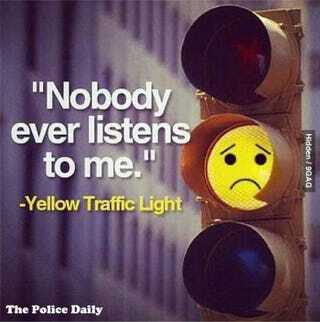 Are yellow lights too short? Filed to: rant? does this qualify as a rant? anyone?Filed to: rant? does this qualify as a rant? anyone? Occasionally, I feel it's actually safer to run a light than slam on the brakes (Note: I'm talking about the textbook definition of not making it all the way through an intersection before the light turns red. Not full on blowing a red light GTA style). Sometimes, it's because the conditions are bad, other times it's 'cause someone's tailgating me like a boss. Either way, it might be a good idea to lengthen the timing, which varies by intersection, speed limit, and jurisdiction. Apparently, some cities are shortening the timing on purpose in order to raise red light camera revenue, which is stupid and potentially dangerous. If I were king, each state would set it's own standardized times and individual jurisdictions would have to abide by that, no matter how much revenue they need to cover City Hall's landscaping costs.